The Engineering Drawings reproduced here enable a thorough examination of developments between 1775 and 1800 and reflect the dominance of the 'Sun and Planet Type' of engine in this period. The material is made available under geographical headings to facilitate regional comparisons, analysis of the distribution of engine types and methods of employment of the Boulton and Watt engines. Henry Coates and John Jarratt (see Portfolio No: 1) for their engine at Kingston-upon-Hull. 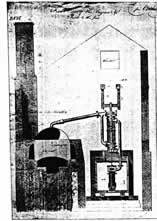 They had the first double-acting engine with straight-line linkage (first drawings dated May 1784). (first drawings dated September 1786). Joshua Foster’s Wool Manufactory at Horbury in the Parish of Wakefield. Payment £812. (first drawings October 1795). Samuel Oldknow of Stockport near Chester (see Portfolio No: 62) for a Cotton Mill at Stockport (first drawings 1791). Lead Manufactory (earliest drawings April 1799). Samuel, Davey Liptrap & Co of Whitechapel Road for a Malt Distillery in Mile End, first parchment dated 1 March 1786. Albion Mill (see Portfolio No: 97) Engines for the large steam flour-mills excited a good deal of discussion at the time and the machinery was inspected by a great many people. Albion Mill was erected on the Surrey side of the River Thames near Blackfriars Bridge. Plans date from 1782. Benjamin Severn for his Sugar Manufactory in Whitechapel. Josiah Wedgwood (see Portfolio No: 97) for 3 separate engines dating from drawings as early as April 1782. Hawkesbury Colliery (see Portfolio No: 241) two Winding Engines, the first of these was repurchased by Boulton and Watt and sold on to the Lancaster Canal Company (earliest date of drawings February 1791). W E Chapman & Co for a Rope Manufactory in Newcastle-upon-Tyne. Sir Richard Arkwright for a Cotton Mill at Nottingham. Samuel Whitbread (Portfolio No: 4) for a Brewery in Chiswell Street, in the Parish of St Luke, Middlesex. This engine was of the Chain-Beam Type. Over 3500 drawings covering some 272 separate engines are brought together in this section devoted to original manuscript plans and diagrams.